I’ve been wanting to post this recipe for a while now, but it took some time to develop it and get it just right. Either the texture wasn’t quite right or the flavor wasn’t exactly where I wanted it to be. I can proudly say that finally, I’ve cracked the code. This toum recipe is da bomb. It’s smooth, creamy, garlicky and deliciously potent. 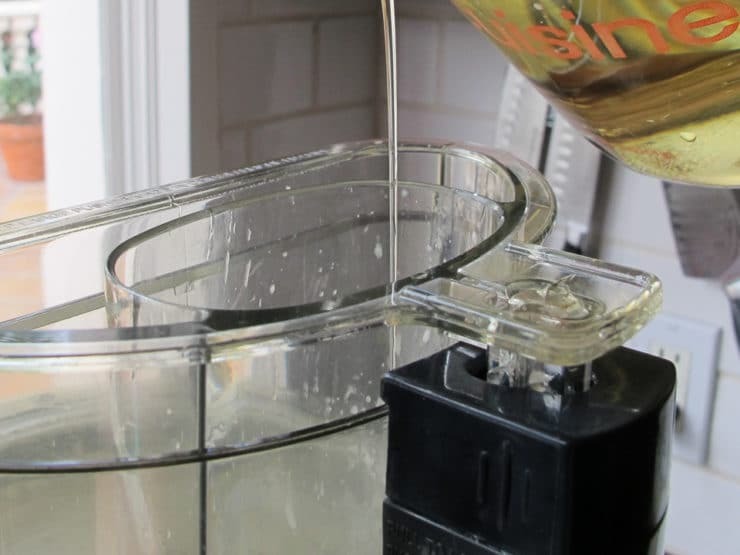 The key was using a big food processor (8 cups or more), making a large batch (big enough for it to easily emulsify in the food processor), using sunflower or canola oil (these mild oils work best for flavor and texture), and chilling the oil. Sound strange? The chilled oil is magic, it helps to keep the sauce from separating. Come on, don’t you trust me yet? 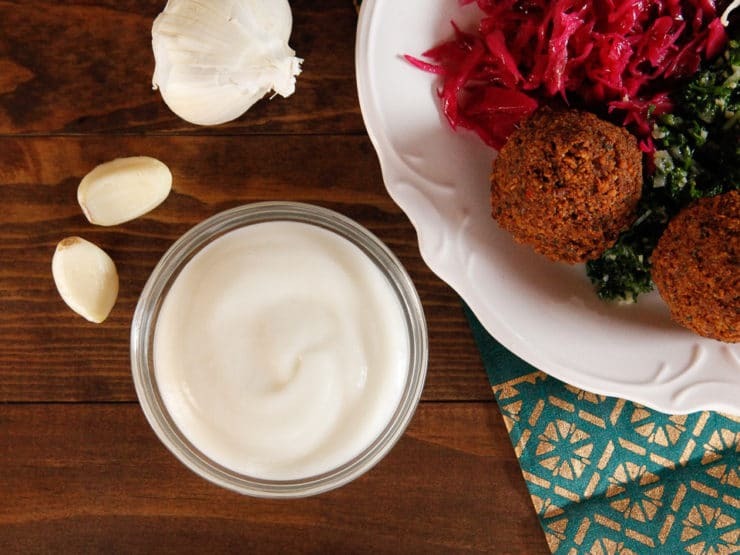 If you’ve never had the pleasure of trying toum, it’s a creamy garlic dipping sauce that is often served in Middle Eastern and Mediterranean restaurants. It’s similar to aioli or mayonnaise, but made without eggs. 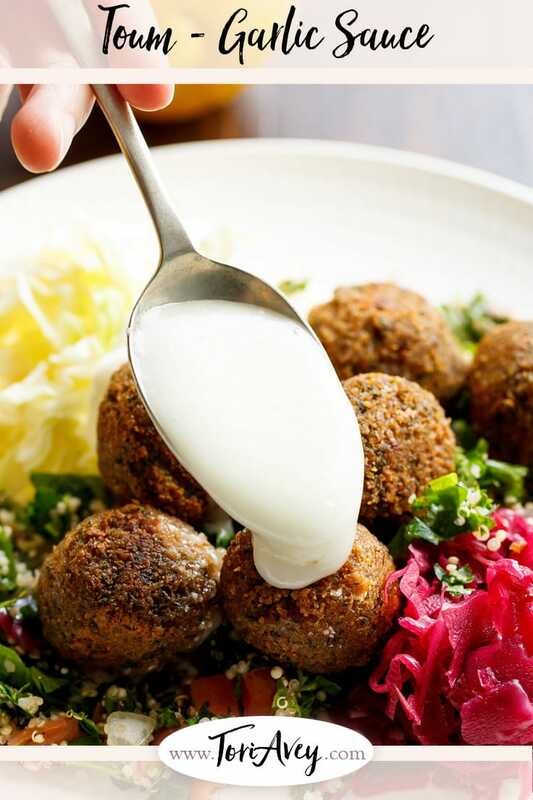 It’s utterly fabulous on falafel, shawarma, grilled chicken, fish, and vegetables— really, anything that calls for a creamy garlic accompaniment. Be warned, this sauce isn’t for the faint of heart. Toum packs a powerful punch. Raw garlic contains some pretty incredible health benefits, and has been used as both food and medicine for thousands of years. Ancient Olympic athletes used to eat raw garlic to boost their strength and stamina. It’s a great source of antioxidants; it also has anti-inflammatory properties. Some studies have shown that eating garlic may help lower high blood pressure and high cholesterol. So toum is not only tasty, but it’s also good for you. Although I can’t promise it will have a very positive effect on your breath. Don’t go kissing anybody after a serving of this stuff! 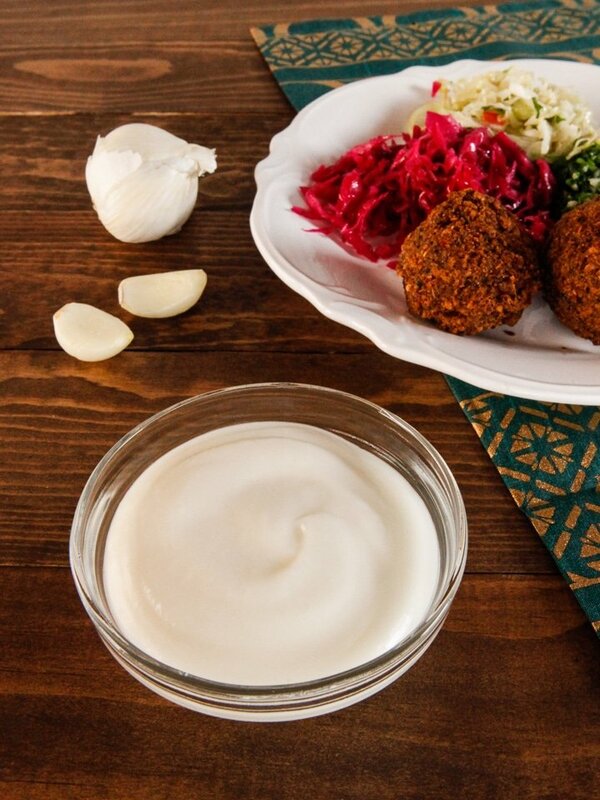 Recipe for Arab Garlic Dipping Sauce. Use on Shawarma, Falafel, Grilled Foods. Vegan, Garlicky, Creamy and Flavorful. Makes roughly 5 cups, 2 tablespoons per serving. 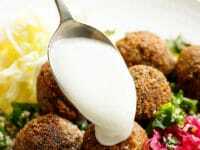 Nutritional Information: Assuming the recipe makes roughly 5 cups of toum (it is never exactly the same amount from batch to batch), you will end up with around 80 tablespoons of sauce. Serving size is roughly 2 tablespoons per serving, which equals 196 calories per serving. Before you begin, place your oil in the freezer or refrigerator so that it is chilled, but still liquid. While the oil chills, remove the ends from your garlic cloves, split them in half and remove any green layers from inside. In a food processor, combine garlic cloves, salt, 1/4 cup of the lemon juice and 1/4 cup of the ice cold water. Turn the food processor back on and drizzle the chilled oil through the top as SLOWLY as possible, one cup at a time. If you don't have a steady hand I suggest putting the oil in a squeeze bottle and drizzling it in that way. After each cup of oil, add 1 tbsp each of the lemon juice and cold water. Only add oil until you've reached the texture you desire - you may only need 3 1/2 cups to achieve the proper texture. The final result should resemble a soft mayonnaise. This recipe makes about 5 cups of sauce, a serving is calculated as roughly 2 tablespoons. Store toum in an airtight container in the refrigerator. This recipe makes a pretty big batch, but it should keep for up to 4 weeks and it can be used on so many things. You'll be happy you have extra. Enjoy! 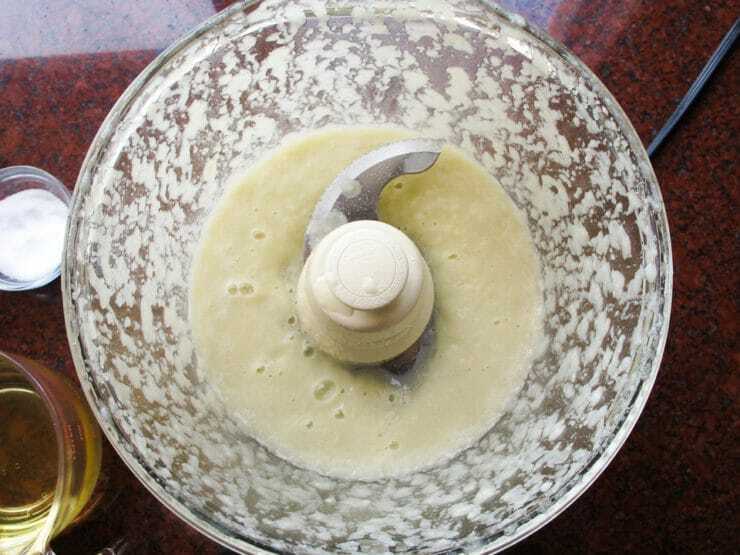 Can I use a blender instead of a food processor? You can, but it’s easier to manage the texture in a processor. You’ll need to do a lot of scraping and re-blending to achieve proper texture with a blender, but it’s definitely doable. Tori – You have an amazing website and recipes. This recipe is superb. Are you able to recalculate the serving size calories? You mentioned in a reply in the comments that a serving (2 tablespoons) is 44 calories. I am not sure how that can be with 4 cups of oil even with the other ingredients. Hi Sarah, unfortunately I am not a nutritionist. I am relying on the calorie calculation that is built into my website, which is fairly reliable but not always 100%. I just went in and recalculated using a different calorie calculator available online. Assuming the recipe makes roughly 5 cups of toum, or 80 tablespoons of sauce (it is never exactly the same amount from batch to batch), for 40 servings it would be roughly 2 tablespoons per serving, which equals 196 calories per serving. The calorie count was calculated using sunflower oil. Glad you’re enjoying the recipes! Great recipe, but when I tried to make it the results were excellent except it tasted bitter any suggestions on what could be done to get rid of the bitterness? This really is an amazing recipe. I am vegan and always avoided this at restaurants because I thought it was mayonnaise. The recipe worked perfectly and I use this on falafel wraps and vegan BLTs. Yum! First of all l would like to thank you for sharing me such a wonderful reciepe. But I want to ask you one question. What could go wrong if we add a little mayonnaise in it? Nothing wrong, it will just give it a creamy mayonnaise flavor. It also will make it easier to emulsify in the blender. If you like mayo, I say go for it! This is a nice food blog. I answered a question about toum on Quora yesterday that links back to your site, and so today I thought that I’d visit your blog. It’s interesting how we both use the term ‘elbow grease‘ to describe an essential ingredient in preparing toum if you choose to do so manually – it’s a lot of work! 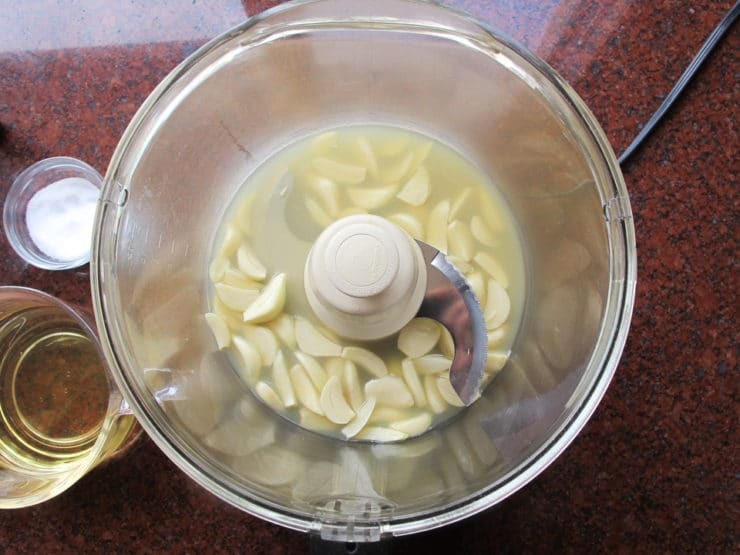 If you want to take some of the ‘rawness’ out of the garlic when you’re processing it, you can add some lemon juice to the garlic just before you press the ‘pulse’ button on the food-processor: this inhibits the presence of the allicin in the garlic (i.e., what gives garlic its ‘garlickiness’) when the cloves of garlic are processed. Here’s my answer on Quora here, in case you are interested. As I mention in my answer, I pronounce the Arabic word ثوم as ‘thoum’ (the Gulf way) rather than as ‘toum’ (the Egyptian and Levantine way), but both are possible and correct – just a question of dialect. Quick question about the nutritional info. It says it is 179 calories per serving, but what is the size of the serving? The recipe says it makes 6 cups. Hi Sharon – the recipe makes roughly 5 cups of sauce (not 6) and a serving size is 2 tablespoons. I have updated the nutritional info to include serving size, it’s only 44 calories per serving. Enjoy! I LOVE toum! I’ve only made it once and it turned out ok, but was a LOT of work since I attempted to make a small batch. You’re right, in order for it to mix properly, you need to add some weight to hold it at the bottom of the processor or it’ll climb up the sides, stick there, and not mix. So that translates to a large batch. Now, since I’m the only one in the house who eats it, and there’s no way for me to consume a huge portion, I’m really disappointed that it’s not freezable. That I know of. So tonight, in lieu of finding a delivery place that has toum on the menu, I’m going for Afghan cuisine; chicken kabob with a side order of mast-o-khiar. Not a substitute, but good! I first enjoyed this delectable treasure at a restaurant in Anchorage that unfortunately went out of business. The proprietor was Egyptian, and a fantastic chef, making not only the food itself but his own ingredients as well. I quickly became addicted to his fare, especially the toum-laced shawarma. Once the restaurant closed, I found myself wanting to reproduce this awesome flavor combination, so I started buying lamb, and finding recipes online to replicate the flavors. I have since made a middle eastern lamb shawarma recipe every year for Passover (without the laffa, of course), and homade toum, tarator and other middle eastern sauces. Everyone who partakes of these delicacies quickly became addicted; so much so that last year when my wife and I were too ill to handle the making of these recipes for our ever growing group, I coached others on how to make them. The toum recipe that I use is much simpler to make, and follows the same concepts. To date, I’ve had several versions of restaurant garlic sauce – all delicious – but none that I like as much as the simple hand made recipe I’ve been using for about 16 years now. My recipe is heavy on the garlic – about 20 cloves for a single batch, uses two tablespoons of Helman’s mayo, just a few drops of lemon juice, cardamon to taste, and 1/4 cup SESAME oil or more. I emphasize SESAME oil for a couple of reasons, one is that sesame oil is a middle eastern product that best fits with middle eastern themed meals, and because it’s flavor in a garlic sauce is superior to all other oils that I have tried, including but not limited to peanut, olive, canola, corn etc. I crush the cloves in a hand garlic crusher into a bowl, add two tablespoons of Helman’s mayo, a few drops of lemon juice, lots of cardamon, a 1/4 cup of sesame oil. Then I simply beat it with a tablespoon by hand continuously by hand until it thickens. Too thick? Drizzle in a little bit more sesame oil, and a couple of drops of lemon juice – from fresh lemons please, no lemon juice from a jar! – and beat with the tablespoon some more. 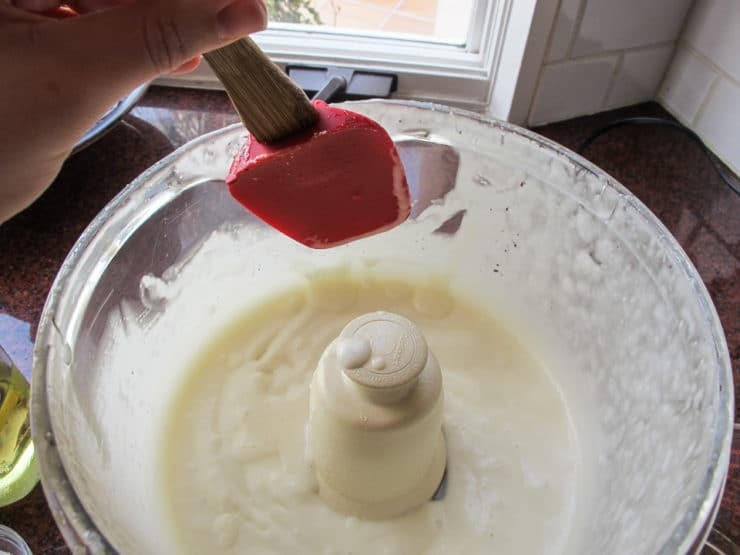 When the mixture starts to get ‘saucy’ enough that it falls off the spoon fairly easily, the product is finished. Add too much oil or lemon juice and it does indeed separate. Takes a little bit of practice, but the ingredients work every time! I’ve made double and triple batches just by tripling the ingredient amounts, and it works perfectly every time. Everyone who has tried this garlic sauce asks for the recipe, and asks for me to make it all the time. Is there a way to make this a little spicier? I mean, can we add chilies or hot sauce? Or do you think the chili seeds will make this separate? I wouldn’t add anything until the sauce is fully thickened and emulsified. At that point you can blend in some hot sauce or sriracha if you want it spicier. I ran out of lemon juice and so I substituted it with 1/4 cup of white vinegar (1/4 cup not 1/2 cup) and it turned out to be perfect! Serving it with mahi mahi fish, potato wedges, asparagus, and fattoush… can’t wait! I tried it and it came out very good, texture wise. For me personally it has too much lemon, next time I make it, I will try with much less lemon. Love this recipe, are usually use avocado oil. Wondering if grapeseed oil would be ok to use? Hi Christina, yes it should be fine. This recipe is spot on but let me share a small trick I learnt from a Lebanese chef who works in a restaurant in London. Add a small piece of raw potato (about the size of a garlic clove), this prevents your Toum from splitting. For the very white fluffy Toum you need to use egg whites but then it doesn’t keep too long. Any good lamb shawarma recipes out there? When do you add the potato? At the beginning or the end? Is it important to add that much oil? I mean I want to use it in place of mayonnaise as an healthy substitute but in this recipe same thing happened. What will happen if I put less oil into it? Hi Manisha, Tori’s assistant Ashley here. The amount of oil used is very important to get the right texture and consistency for this recipe. Please also note that toum has a VERY potent flavor, so be sure to use much less than you would with mayo. I’ve messed this up countless times before. This was perfect as written – thanks! When I made this, I used ice cubes instead of water, and put the sunflower seed oil in the freezer for an hour or two before I made it. The oil came out significantly thicker than at room temp, poured very slow, and the resulting Toum was *perfect*. The ice cubes rattled around disconcertingly, and even caused a teensy amount of splatter to escape what I thought was a safely sealed food processor container. Still not sure how that happened, but it was fine. After craving chicken shawarma and toum that we used to eat regularly at a Tunisian restaurant before we moved, I found your website and made those recipes, since your toum recipe called for the exact ingredients (no less and no more) that our restaurant stated they used! My husband said it was one of his favorite dinners ever- thank you for making these dishes easy to make in the average kitchen! Hmm… you could maybe try adding less water next time to see if you can get the thicker texture you desire. You will need some water, but if you cut it a bit you might get the consistency you are looking for. Good luck! Absolutely delicious!! Thank you for posting. I have a Vitamix so I just threw everything but the oil in the blender, gradually increased the speed, added the oil and it became the most delectable addition to my vegan Shawarma wrap. I used DOCG olive oil I just brought back from Italy. Definitely green-ish but so yummy! Hello! My local restaurant Layla’s Lebanese restaurant serves “Garlic Whip” and wanted to make it at home. I think this is very similar so I’d like to give this a try. This one looks runny but Layla’s Garlic Whip is more like whipped cream/sour cream kind of consistency. If I omit water do you think this will be thicker like whipped cream? Also can I freeze them? I think I will have some leftover and I don’t want to keep in the fridge since because of garlic smell. Or do you think this will separate? Hi Yoko– you add liquid to this recipe until you obtain the desired texture. So once you get to a texture you like, stop adding liquid. I’m not sure about freezing the sauce, it might separate… can’t be certain as I haven’t tried it myself. This is the best batch I have every made. Perfect recipe! Delicious on everything! Hey there, I followed your recipe and my toum came out very watery, as well when I tried it, it tasted very strongly of the oil. What am I doing wrong? Hi Sandy, please read through comments as this has been addressed repeatedly. Also, I am working on a video to show this process in depth and hopefully help clarify it– emulsification is a tricky thing to master, and really has to do with patience– the drizzle of oil must happen very, very slowly. This recipe is so simple and delicious. We like it best with at least 1/2 cup of olive oil, but not too much because it can easily overpower the recipe. If my garlic is particularly zippy, I will add a drop or two of honey and two or three cloves of roasted garlic. We use it for just about everything, but my two favorite ways are in a pita with falafel instead of tahini sauce, and a dollop on top of scrambled eggs. YUM! I made a half recipe of this last night in a food processor with no edits; it came out perfect! This tastes just like the stuff we get at a tiny, family owned Lebanese restaurant we’ve been going to for years. Thanks for sharing, this recipe is an absolute keeper! This recipe makes the best garlic sauce. Loved it! I used canola oil. Made a half batch for a campfire party and with 8 adults we polished it off pretty quickly. Was great as a dip with potato wedges, also did chicken schawarma over campfire coals served with this toum, hoummus, mango chutney, chilli paste, some tabbouli. Thanks for the great recipe. I thought I followed the recipe exactly, but the final product was too “liquidy.” Any tips on how to correct or how to prevent next time would be greatly appreciated! Trish, please read through the comments, lots of tips there. Made this recipe but cut it in half and used my small food processor. Worked great and so fast and easy! I love it in place of mayo since I’m a garlic lover. And I could see adding all kinds of different flavors, like herbs or spices! Also love that there’s no egg! Just a note: most all food processors have feeding tubes or parts on top that have small holes in them just for the purpose for adding a liquid in a slow stream. Check it out! has anyone used Olive Oil? I am not able to eat the oils you listed, but can eat olive oil, avocado oil, grapeseed oil. Avocado oil would work well in terms of flavor, however it may give the sauce a greenish hue. I used avocado oil today because I didn’t have the others. It is fantastic! I added a little more lemon juice and some garlic powder because we like it a little tangier, and I ran out of garlic cloves (I did a half batch with a half cup of cloves, and it just wasn’t enough garlic, thus the powder.) Also, I don’t have a food processor, so I used the “processor” attachment for my stick blender. Anyone have a spicy lamb shawarma recipe they love that they’d like to share? Cannot wait to try this ! I had this “garlic “paste” on a recent trip to Cedars of Lebanon restaurant in Roanoke VA. This sounds exactly like what I had a small Indian/Asian restaurant – was soooo good. Have to give this recipe a try! Mine came out watery. I tried cutting the recipe in half so I wouldn’t make so much. Any way I can fix this? Hi Nicole, Tori’s assistant Ashley here. I’m not entirely sure what went wrong, but I do know that it’s very important to slowly drizzle in the oil until you reach the consistency you like. Also, be sure the toum hasn’t separated as a result of the processor getting too hot. Hello! So there’s no fix if it came out watery? Greetings and THANK YOU! Fabulous recipe! I had just made falafels and wanted to try this but I had only limes and cold Walnut oil. Delicious! OMG! I used crushed garlic in a jar and we love love it! Thinking of other things to eat it with! Warm tortillas, toast, tortilla chips! So easy to make! How much of the crushed garlic did you need? Would this be good if I switched to using roasted garlic in the same amount as the recipe recommends? Hi Della, Toris’ assistant Ashley here. It’s best to stick with raw garlic cloves for this recipe. Thanks 🙂 so excited to try it! Hi Sarah, Tori’s assistant Ashley here. Sunflower or canola oil really is best for achieving the right flavor in this recipe. What are the potential alternative equipment for this recipe if you don’t own a food processor? Hi Nathasia, Tori’s assistant Ashley here. A high powered blender would likely do the trick. You need something that will produce a smooth consistency. I can confirm that this worked just fine in a blendtec. I imagine most blenders will be okay because you really are just whipping air into the oil. You might not get as smooth a sauce since blenders won’t cut the garlic. My Ninja (old school one with motor that sits on top) blended everything just fine. I poured in through the spout so I wouldn’t rush the oil. How did the ancient people make it without a food processor? Is there any other way to emulsify oil? Is rice bran also fine as a replacement for sunflower and canola? I am not very familiar with rice bran oil so unsure how it would taste in this recipe. My guess is that ancient people (if they made this at all) used good old fashioned elbow grease and some sort of whisk to emulsify– not an easy proposition. But I’m not really sure when this sauce developed, so it’s hard to say. Elbow grease makes it taste weird. I’d stick with canola. If they didn’t have food processors, they didn’t have refrigerators either. Ergo, smaller quantities were probably prepared using manual labor. This recipe was the best ever. I made it with my young daughter and the family loved it! I made this today and it was PERFECT! I followed the directions exactly. Everyone in our family loves it; we plan to use it to replace mayo because it has so much flavor. I don’t think I’ll ever go back to regular mayo since this is so delicious and easy to prepare. There are so many uses for toum… vegetable dip, salad, a side for meat. Thank you so much for posting this recipe!